Sometimes, when we acquire something new (lawn mower, camera, stove), the desire is to use it immediately without reading the instructions. It’s only later that we find ourselves returning to the manual for more meaningful guidance. 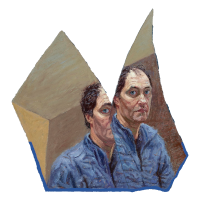 I think painting can be a bit like that. Wading through artists text before seeing the work itself is often a turgid task. If the paintings have merit, then you’ll return for more nuance and insight. So feel free to skip the text and go straight to the paintings. This show was partly shaped by a change of location for myself and my family. Our home has large, square and rectangular windows facing in all directions. While the main frontal view is the one that might arrest visitors, I’ve been drawn to the steep bare hill at the back of the house. Bare, except for a few totem birch trees, an arcing moon and a wheeling universe. They have been imprinted on my mental retina, as a bright window might be if you suddenly close your eyes. Lunation is a period of time, from one new moon to the next. While my work always suggests a sense of place, the lunar presence inevitably creates a sense of time. Locked, fixed time. They are not, in particular, paintings of timelessness. My clock is ticking, so is yours. Ticking meticulously. At Mangersta, our lunar neighbour woos the oceans, causing them to rise and fall. It’s an ancient rhythm that might appear infinite. One wave gathers, rises and dissolves, a one-off. Like breathing. Random, even chaotic, but the pattern is fixed, repeated, precise. Perhaps having children has made me more aware of time. For them, now is everything. We say ‘later’ they say ‘not later’. With age, my mind increasingly wanders towards ‘later’. From the now to the next. The here and now to the hereafter. Is our traverse any less pre-ordained than that of the moon? Our arc is comprised of seconds, minutes, hours, days, weeks, lunar month after lunar month. To know the end and measure of our days. Many aspects of my paintings have also been fed by an ongoing admiration for Canadian artist Tom Thomson. His nocturnes, birches and monumental skies are all elements that reappear in my work. 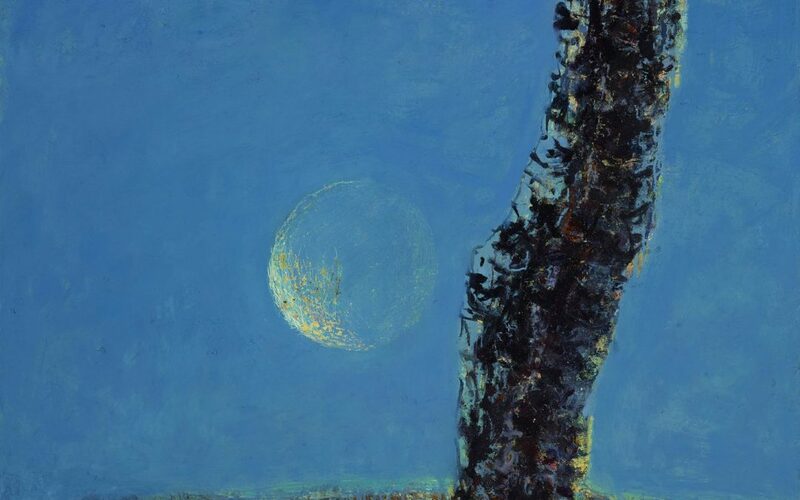 My beech nocturnes, partly attributed to the children’s programme In The Night Garden, are also indebted to the immediate effect Thomson’s night paintings first had on me. His use of colour is lauded but it’s his control of tone that distinguishes his paintings. Tone is the dull sister of Colour, the exotic sibling that mesmerises everyone. The journeyman versus the showman. But its mastery can take a lifetime and Thomson seemed to acquire it effortlessly. I like to describe myself as an involved bystander. Static yet active. Here but out there. Earthbound but boundless. A couch astronaut.